Female common goldeneye. Photo by Josh Silberg. 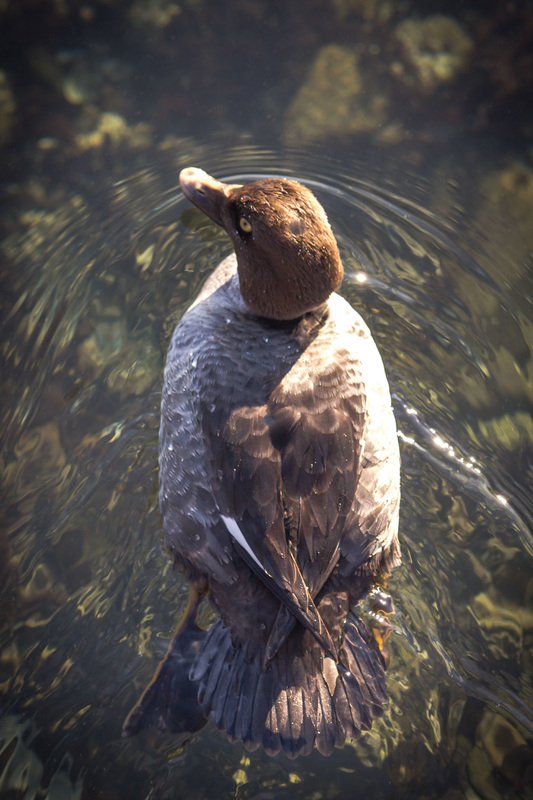 True to its name, this diving duck has distinctively bright golden eyes (paler in females) that contrast with dark richly-coloured heads: dark glossy green in the male, and chocolate brown in the female. The male can also be identified by the bright white, oval-shaped patch on both sides of its face, between its bill and eye, and the contrasting black and white on its body and wings. The female's body and wings are grey above and white below. The medium-sized duck's chunky appearance and large, somewhat triangularly-shaped head may aid identification, especially from a distance. The common goldeneye can be found on the Central Coast in winter, in sheltered coastal waters such as bays and estuaries. Most spend winter in these saltwater habitats, but the species can also be found on inland lakes and rivers where they don't freeze over. The winter range covers the southern half of North America and stretches north along both coastlines of the continent. The common goldeneye migrates north and inland to the boreal forest to breed in summer. Both the female and male of this species may be easily confused with their Barrow's goldeneye (Bucephala islandica) counterparts. For the female, check out the bill colour if you're unsure: the common goldeneye's bill is usually all dark grey or dark with a yellow tip (rarely all dull yellow), compared to the fully yellow-orange bill of the Barrow's. For the male, check the shape of the white face patches: those of the Barrow's are crescent-shaped, while the common goldeneye's are oval-shaped. The head shapes are also a bit different; the common goldeneye has more of a forehead slope than the Barrow's. More information on differentiating these species can be found on the Cornell Lab of Ornithology's species profile. This species is called the "whistler" by hunters after the whistling sound made by its beating wings. Chicks start off with grey-brown eyes that shift as they mature to purple-blue, then blue, then green-blue, then green-yellow, then finally yellow in adulthood. Common goldeneye (Bucephala clangula). Audubon Guide to North American Birds. Accessed 19/04/2018. Dunn, J. L. and Alderfer, J. (Eds.). (2011). National Geographic Field Guide to the Birds of North America. (6th Ed.). Washington, D.C.: National Geographic Society. Pp. 44-45. ​Eadie, J. M., M. L. Mallory, and H. G. Lumsden (1995). Common Goldeneye (Bucephala clangula), version 2.0. In The Birds of North America (A. F. Poole and F. B. Gill, Editors). Cornell Lab of Ornithology, Ithaca, NY, USA.